Stunning black and white Zebra striped oval beads. Lovingly designed irresistable Calsilica necklace. The perfect gift for that special person. Calsilica is a synthetic stone that is manufactured from a mixture of calcite, resin and artificial colouring pigments. The different coloured bands through Calsilica are powdered carbonate rock artificially colour and then stabilized with resin. The bands can come in any colour. Despite being a synthetic stone, Calsilica has been increasing in demand for fashion jewellery. Although many claim that Calsilica is a naturally occurring material, there is little evidence to support this claim. 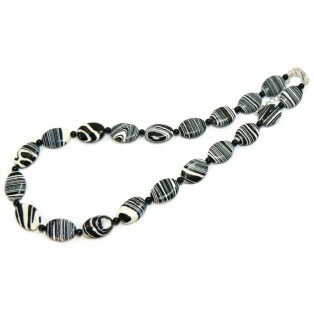 This necklace measures 18.5" (47cm) long and has been fitted with a 2" extension chain to make it longer. The clasp and chain are Nickel Free silver plated in accordance with the EU directives.